I’m in this for the little baby. It’s not his fault that I did what I did. People should know that this is the worst, best decision I have made in my life. Strangers will understand my story before my own family. That is why I have a new family! 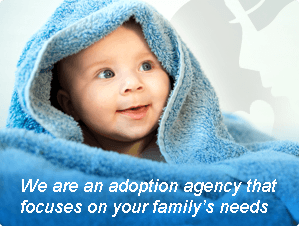 Thank you and this wonderful adoption agency for being there for me! I had an unplanned pregnancy last year. Yeah maybe I should have been on birth control or kept my legs closed. I could have even gotten an abortion but I thought that it might ruin my chances of having kids in the future. So I didn’t… I chose adoption. I love people; I really I do. But sometimes you just can’t do things right in everyone’s eyes. Not that I really give a care what anybody thinks of me except for the people that are in my everyday life. I chose to put my child’s need before what my heart wanted. In my heart I wanted to keep her and raise her with my fiancé, but I didn’t. I chose a wonderful couple who kept their promise as I kept mine. October 10, 2015, marks one year that I spoke to this couple for the first time. I have no regrets. I chose what was best for my daughter. In my heart and mind I am at peace. I didn’t “sell my baby”; I hate when people say that! I chose for her a life that I couldn’t give her… A life without struggle, a life without needing or wanting, a life full of love and part of that love comes from me. What I am most grateful for is the support that I have received from the Adoption & Family Support Center and our birth mother support group, Placement from the Heart. With them I have gained another family, shared love and found people who understand what I have been through. Society looks down on women who put up their children for adoption, and this couldn’t be farther from the truth. These women, myself included, have made sacrifices for their children. We deal with heartache and pain every day, and live with a hole in our hearts that can never be filled. I remember reading adoption ads while trying to look for a job. A job, that’s a joke, no one would hire me with my very pregnant belly. I still remember my breaking point and when I decided adoption would be the best choice for this precious baby I was carrying. Then I saw this ad say “adoption is personal” and I thought I could actually get help with a real person and not a bunch of documents sent federal express. I got this lady named “Lisa” who honestly I don’t think was ready for me. I was hysterically crying and I didn’t know how far along I was, I had no pre-natal care except for taking over the counter pre-natal vitamins but I knew that I had to do this for all my children to be okay. Even though I never me this woman, I could feel her heart open up for me as we talked. She asked if she could get a hold of her boss and have her meet with me that same day. I agreed and gave her my address. By 6:00pm that day I met my “angel”. Angela was in my driveway. I selected a family; the adoptive mom was a woman who was a NICU nurse and the adoptive dad was a youth pastor. I knew my son was going to be born as a preemie, who could ask for a better fit and it eased my mind knowing that my son was going to be taken care of. Angela set up our first call and it all clicked. She was perfect and so was he. So I decided this couple was it and this was the day before Mother’s Day. That night Angela stayed with me but I couldn’t sleep. All I could do is stare and wonder how I was going to go through with this adoption. The next day, I met the adoptive parents. And even though this hurt me so bad, it all felt so right. Angela told me how she experienced this with adoptions and about how it was just meant to be and it would happen the way it is supposed to happen. Honestly, I didn’t believe her, but it really did happen. 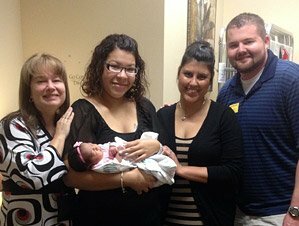 That last day while I was doing the paperwork, I was surrounded by people I grew to love just as family, maybe even more than family and all because I wanted more for my son.